IMPORTANCE OF NATURAL POINT OF AIM in 10 M Olympic Air Pistol Shooting. This blog addresses the relation of the Natural Point of Aim with stable stance, reduced arc of movement and proper follow through execution. What is Natural Point of Aim (NPA) in Air Pistol Shooting? There is a point on the target, where the aligned sights of the air pistol shooter settles with the minimum amount of effort. And this position can be maintained by the shooter for the amount of time it takes for him to execute proper follow through. Ideally, this point should be within the aiming area or ‘hold’ area of the air pistol shooter. All of us are aware of the importance of maintaining a stable stance or shooting position. A good stable shooting position or stance helps in reducing the arc of movement. When an air pistol shooter has taken his stance based on his NPA, he will notice that his arc of movement is not only reduced but also, the time taken for reducing the same is much faster. When you can reduce the arc of movement within a second or two, you can concentrate 100 % on correct follow through. In Online Air Pistol Training Module No. 2 Technique for shooting a ‘10’. I have devoted three separate videos on the Natural Point of Aim and how you can get your NPA. These videos discuss not only how you can obtain your NPA but also when and how many times you should check your NPA, during a Match. Knowing and understanding the concept of NPA is one thing, but implementing this vital knowledge in your daily shooting routine is another. I have seen Air Pistol shooters being very lackadaisical in their approach towards NPA. 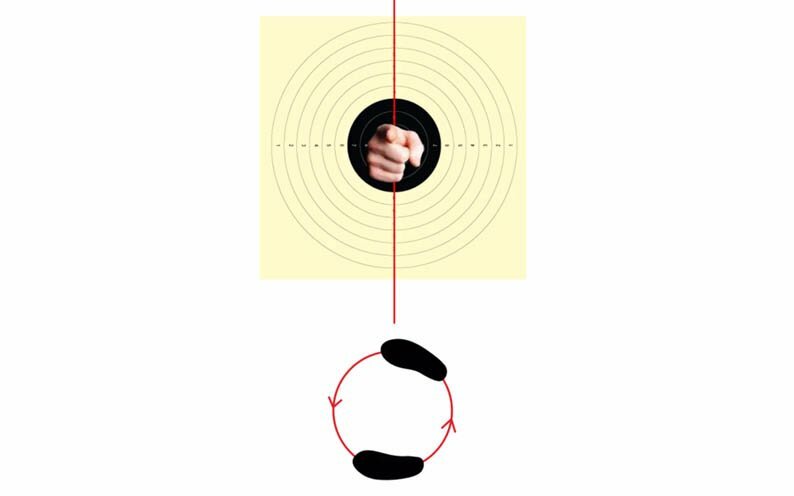 If a shooter has really understood the importance of the NPA and how it can save him valuable points, I think he would be a bit more disciplined in applying this technique to his shooting routine.